There is nothing more fun than Sweet Summer Birthday Party! If your lil one’s birthday fall in summers and you are looking for stupendous Summer Birthday party ideas in India, here you go! 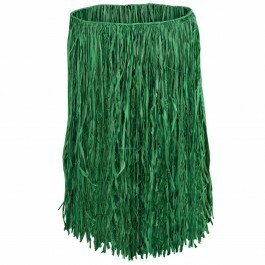 With our ideas, you and your friends will soon be celebrating sunshiny days and balmy summer evenings in style! 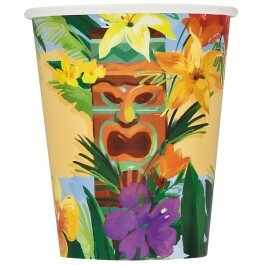 Plan to host your summer party before the dog days of summer and brutal temperatures settle in. For most, that is before the month of August. A Saturday afternoon, or a public holiday, are the ideal days to hold your party as they will ensure the most number of invited guests are able to attend. Plan the party to start in the early afternoon in order to take advantage of the longer summer evenings. Some summer party ideas for hosting includes a pool party, beach party, or party on the lakeshores. A picnic at an area park is another great idea. There are many summer party themes to pick from, including fun in the sun, surf’s up party, and a party celebrating all that nature has to offer during these balmy summer days. Keep the invitation simple with some white card stock and some stickers or die-cuts related to your party. For example, if your party is about having fun in the sun then you could include imagery of a smiling sun and of people playing on the beach. 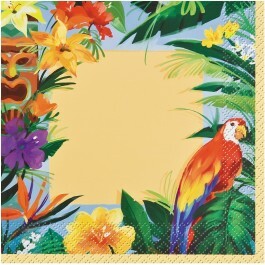 Make things easy on yourself and pick from some of our prepackaged summer party invitations that include a number of summer birthday party themes. For a "Surfs Up" party, cut out card stock in the shape of a surfboard. Use some bright colored paints or markers to individualize each invitation. Nothing says it is summer time quite like a pair of flip flops. 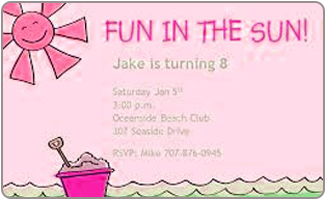 Cutting out flip-flop shapes from thin foam board can provide you with the perfect base for your invitations. Use a permanent marker to write your party details on the flip flop invitations. A beach ball shaped invitation is a great way to kick off your summer party. Use markers and paints to design your invitations, ensuring that you use some fun wording like "Bounce into a summer of fun with us!" If hosting the party in your backyard, with access to a pool, a rousing game of Marco Polo is a must for everyone! 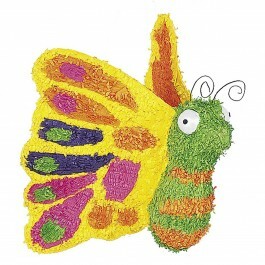 A summer theme pinata such as a Butterfly pinata or flower pinata will make stunning party decoration and a gala party activity too. Ensure that little kids have pool noodles and arm floats to help keep them safe while they play water tag or a pool version of Simon Says. For parties with strong swimmers in attendance, throw coins into the pool and have each party guest dive to retrieve as many coins as they can in one single breath. The person who retrieves the highest value of coins wins the prize. Offer little kids a swimming pool just right for their age group, along with some fun floating toys. A bubble machine can also provide them with lots of outdoor fun. A water balloon fight is a light hearted way to ensure that everyone is able to run around without overheating. Make sure that you have plenty of balloons filled with water so that everyone can have a turn at getting thoroughly soaked. 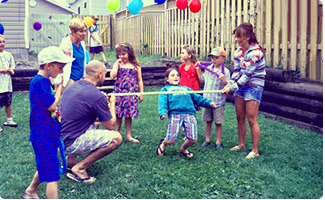 A slip n slide is another of several summer party ideas that will provide plenty of fun and an opportunity to cool down. Just make sure all of the guests know to bring their swim suits and a change of dry clothing. Costume jewelry will give the little ladies something to keep them busy indoors during the hottest part of the summer when it becomes simply too hot to venture out. Bouncing balls and plastic army men will keep the little guys occupied indoors. Fruit candies offer a sweet treat to be enjoyed later. Flip-flops, sun visors, and sunscreen, fun shades in different colors will remind everyone to stay cool and stay safe in the sun. Summer is all about grilling outdoors, so be sure to include plenty of burgers, hotdogs, corn on the cob, and perhaps even a few vegetarian burgers for your vegetarian friends. Whether hosting the party at the beach, a park, or in your back yard, some summer party ideas for sides include potato salad, pasta salads, fresh fruit salad, a vegetable tray, and plenty of dips for your fruit and vegetables. 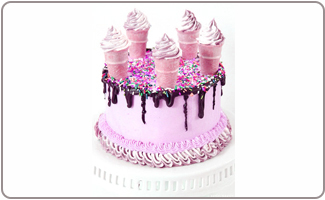 Ice cream is a great choice for any of your summer party themes, and it can make a superb option for a birthday cake. 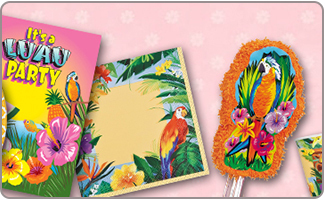 Decorate the birthday cake with some summer-themed cake toppers. Keep punch and pitchers of water cool and refreshing with large ice cubes that you can make yourself. Simply use a silicon muffin tray to make the oversized ice blocks for your refreshments. Add a slice of lemon on top of each, just before freezing, in order to add a subtle lemon zest to your pitchers of water. Have a cake designed to suit your theme. 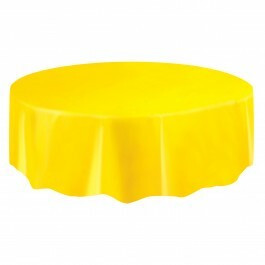 A bright yellow sun is a great choice for a sunshiny party, while a surfboard will help to celebrate your radical surfer dude party. Inflate several beach balls and leave them around the party space to serve as decorations and a source of entertainment. 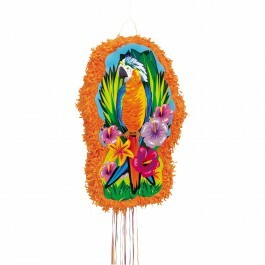 Inflatable palm trees and surf boards are also fun additions to your summer party décor. 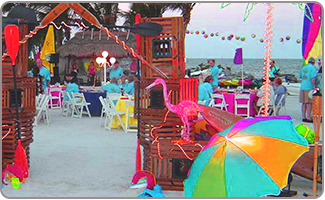 Keep your summer party themes going with beach towels used as table cloths, and centerpieces created using plastic beach buckets and spades. 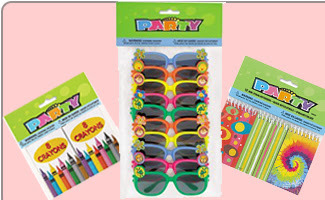 Search our selection of summer birthday party supplies for coordianted tablecloths, as well as cups, plates, plastic utensils, napkins, and even party balloons to add a fun summer festive touch. Suspect blue streamers and blue cellophane for a fun beach look, add cut outs of surfboards, shark fins, coconuts, and a bright yellow beach ball suspended from the ceiling as the summer sun. Flip-flops aren't just a great way to decorate the party, but they will make a fun return gift for all of the guests to take home. 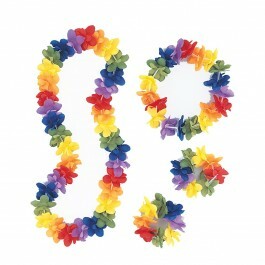 Buy several pairs of flip flops and use them as decorations around the party space.